Ever felt like you need a vacation from your vacation? SAME. I’ve gone on several trips these past few years and each time I learn a little more about how to power through the post-vacay slump. Whether it’s a weekend trip to the coast, a week on a tropical island, or even a road trip, no one is immune to those dreaded first few days back home. These tips will have you feeling back to your normal happy/healthy/productive self in no time! Before you leave your destination to head home, separate your dirty laundry from clothes you never got around to wearing. These packing cubes make it a breeze, otherwise you can always improvise with a small trash bag or grocery bags. Also, if you managed to pack just enough clothes and not too much, hit me up with how you became an actual wizard. We vacationed to Belize earlier this year and our resort did all of our laundry, including swimsuits, before our departure! I was blown away by that, it felt great unpacking my suitcase right into my closet. 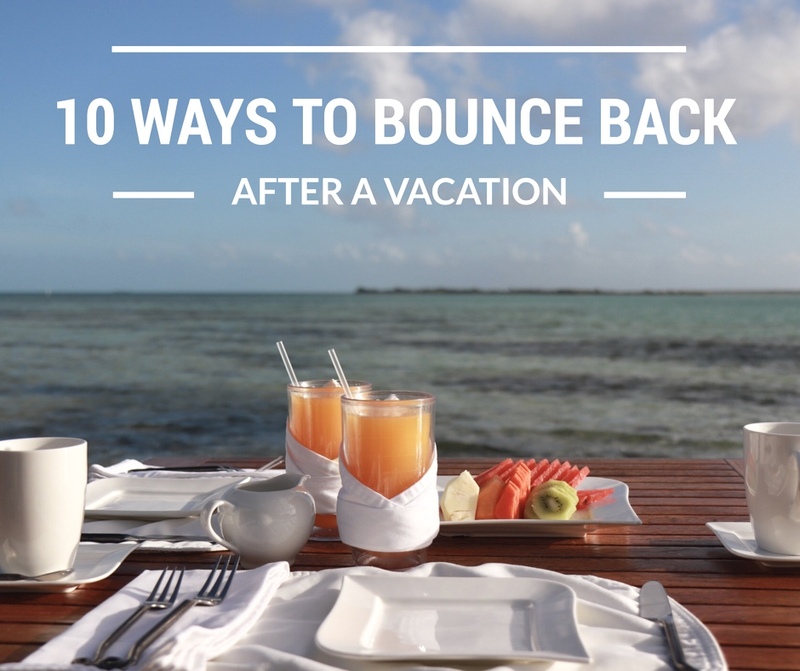 Try to resist indulging too much on the last big meal/night out on vacation. You won’t be feeling your best on your travel day, and you’ll be feeling all that sodium (swelling!) in your fingers and toes! Couple that with a long flight or drive? Yeeeesh. Plan to return home with a day to spare before returning to work. You can do laundry, work out, get groceries, and get an extra night’s sleep in your own bed, awaking on Monday ready to be back in the swing of things. HYDRATE. This is an obvious one, but when you’re feeling sleepy or lethargic, drinking 75 oz of water is the last thing you might feel like doing. Just do it, you’ll definitely feel better. Eat as clean as possible after returning home! Not just because it’s more healthy, but because it does wonders for your energy levels. If you’re used to nonstop snacking from the week prior, (I’m guilty of this. Who needs to bring a bowl of chips to the pool?? Hi, me.) cut up some fruit and veggies and throw them in the fridge to avoid reaching for the bag of Doritos. Try to spend 15 minutes your first day back to work organizing your day. Maybe it’s not the best idea to go through 212 emails from start to finish! Skim through for urgent issues, then go back and read (and respond if necessary) to 20 then take a break to complete a different task before tackling the next 20. Plan the next thing! Not another vacation (unless that’s your style) but make plans with your friends to try a new restaurant the following weekend for dinner. Having something to look forward to can make a world of difference. Overall, when you’re feeling sluggish and rundown those first few days post-vacation, practice gratefulness! Organize your photos and think about the great memories you’ve made. You’ll be back to your normal productive self in no time. Photos taken at Cayo Espanto private island, Belize.